Ancient runes are a unique and fascinating tool of divination. Runes are small chips, stones, or pieces of other materials that bear symbols. 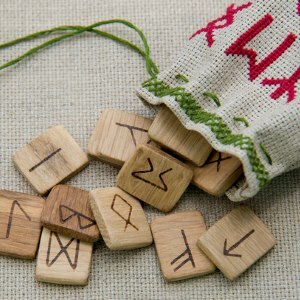 During runcasting, you select a specific pattern or arrangement for the runes and pull them from a pouch or satchel. You then use the meanings behind the runes to divine your future path. Many people consider runes to be manifestations of your conscious mind. The runes you pull from the pouch represent your will and your intuition, which will allow you to choose correct decisions and align your choices with your values and beliefs. Others see runecasting as a fortune-telling exercise. You're calling upon a higher power to guide you through the runes. Neither explanation is wrong. In fact, they both lead you to the same place: greater knowledge and understanding of the road before you. If you want to try runecasting, you'll need a quiet, safe, and peaceful place to practice. Gather your runes and mix them up in your pouch. You'll then choose a layout or "spread" for your runes. If you've ever had a tarot reading, you're familiar with the basic process. The only difference is that you'll select runes for yourself instead of relying on a psychic or intuitive for a tarot deck. There are many different runecasting traditions, each of which uses its own distinct alphabet or symbols. The most common is the German Elder Futhark alphabet, but you'll also find runes that come from other parts of the world. It doesn't matter which types of runes you use. You might want to try multiple alphabets to determine which works best for you. You'll use the meaning of each symbol in your spread to gain insight into your question or problem. What Information Can You Divine From Runecasting? Many people use runecasting to see their path into the future, but that's not the only possible application. You can also use runecasting to gain insight into your past or to understand your present situation. Just as online psychics deal with issues of the past, present, and future, runecasting is useful for all periods of life. You must simply focus on your question, problem, or concern so that the runes you draw relate specifically to it. What's the Simplest Spread to Cast? When you first start out, consider using the one-rune spread. It's simple and easy, which makes it easier for you to focus your mind and gain insights on your first try. When you try the one-rune spread, you'll focus on one specific question. The rune you select addresses your personal feelings and attitude toward the question and eludes to the possible outcome. When you master the one-rune spread, move to two runes. The more runes you add, the more focus you'll need to gain appropriate answers. Runecasting offers a complex and useful tool for divination. The more you cast runes, the more insight you'll gain. While it takes time to learn the layouts and master the art of runecasting, you'll find it therapeutic and, ultimately, informative.